Once upon a time there was a family who lived in a paint can whose children were named Flat, Matte, Eggshell, Satin, Semi-gloss and High Gloss. As it is with most families, each child could not have been more different from the other. Their last name was Sheen, but they were not related to Martin or Charlie. I think. It is my privilege to introduce the children. Youngest were the twins, Flat and Matte, who most could not tell apart. Upon closer inspection, however, it became apparent that Matte’s face was a tad shinier. They were both quite beautiful with smooth, velvety complexions, but were quick to reveal underlying blemishes and imperfections. For this reason, they did not like children or pets and were unforgiving to their messy and careless ways. They could not shed their onslaught with wipe of the sponge once they made their mark, but they did touch up well with paint. Don’t we all? Thank God for make-up! Anyway, Flat was sent to play on the ceilings to avoid Shiny Ceiling Syndrome which is to be avoided at all costs! I mean even Gwyneth Paltrow’s appearance is detracted by the shine. Same goes for ceilings. Their older brother, Eggshell, was an easy going guy. He got along with everyone because he could roll with it. If someone threw mud or tomato sauce on him, or the coffee pot exploded, no problem! He picked himself up, brushed himself off and started over again. Yes, he cleaned up well! And he looked good, too. (Don’t tell him though, he already knows it.) He had a slight sheen, barely noticeable because he was just so darned amiable. Then there was Satin, also known as Pearl in some circles. What is about the middle child? Always a high achiever, well-adjusted and most relaxed. Satin was durable, smooth and hardier than her siblings. It was her job to safeguard trim, cabinets and doors. She accomplished this with aplomb, creating contrast with her duller siblings, but never getting carried away or stealing the show. Semi-Gloss was a hardworking chap. Sometimes people preferred him over Satin for their wood coatings, wanting more sheen and durability than the younger sibs could provide. He would oblige. He got to play indoors and out and that suited him just fine. And finally, the oldest, the strongest and steadfast was High Gloss. He pretty much was relegated to hanging out on front doors and on Halloween, he would dress up as 10 Downing Street. Such a flamer! Shine on dude! What about the parents? They don’t enter into the story just as the parent’s didn't in the Spanky and Our Gang series. The kids just take care of themselves. Going to get geeky here now. 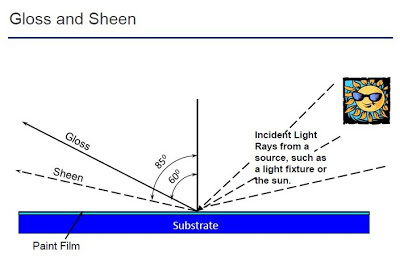 There is a difference between the terms sheen and gloss which are often used interchangeably. Who knew? Gloss, which includes satin, semi-gloss and high gloss, is measured by a 60 degree angle of incidence, while sheen, flat, matte and eggshell are measured by an 85 degree of incidence. 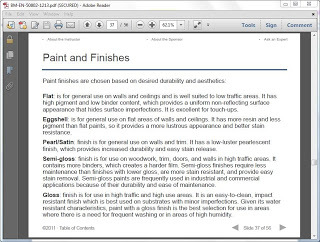 Here’s the run down on gloss and sheen that I cut and pasted from Benjamin Moore’s online paint technology course. Well, I hope you enjoyed the tale. If you have any questions, please don't hesitate to call me and we'll discuss it.